Discussion in 'Reloading' started by Mike Overlay, Dec 16, 2016. I walked by my bench and said..."hey...lookee there....that's my reloading bench. Sorry I haven't been to see you lately. And they I kept walking. Rockchucker and FatboyFlash like this. I take it you haven't started your cast-a-thon yet? Nope...The wife still needs me...still down and out. I haven't done anything yet because I have been too busy here watching the site change by the minute. I will be cleaning my pig sty of a reloading room just shortly. Oh ya... punched both lungs...took 5 steps..laid down and it was done..
1st shot (about 120yds) hit a 2" sapling it was standing behind (light was fading and though she was in front of it) and fragmented/deflected. She ran back towards me and turned broadside....and that was it..
Got my 45acp sizing die in the mail yesterday. Laid it on the kitchen table to ponder it a while. shamed to say ... nothing. Dusted off the press to get ready to load a batch of 357 wad cutters. I went against buying what I was planning on (Hornady LnL), and bought a Lee Pro 1000. I know, go ahead and say it, lol. I set it up last night after work, and so far have loaded 300 trouble free rounds with it. Hopefully it stays that way, haha. For me it looks like it may be the first time in 45 years that I haven't killed any. Oh this is sad .... very sad. 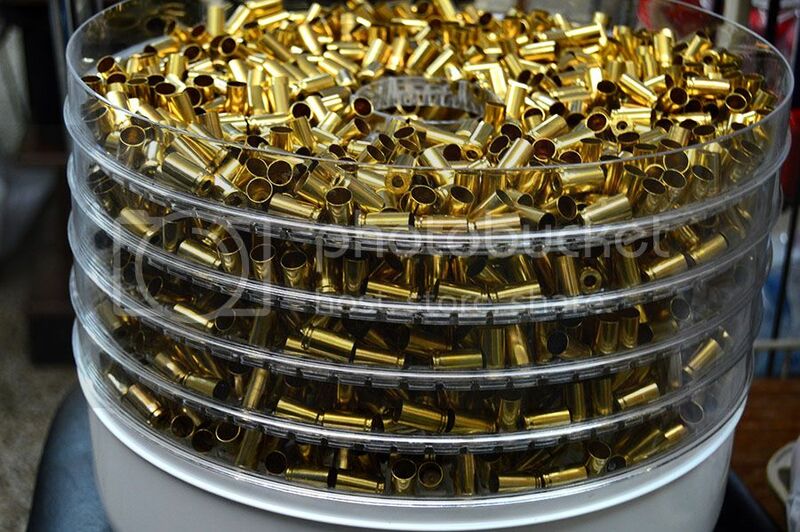 Loaded the rest of my 147gr zombies and plan on loading some 223 today. Sized (250) 200gr LSWC. Loaded them over 4.5gr of Red Dot. All plunk tested. Going to the range shortly to make sure they'll go thru the cardboard. Do you need it? I have plenty, and asked only because they were available. Did some brass prepping, wet tumbling with the Frankford Arsenal rotary tumbler. Dehydrated some brass. Lager, degenerateJEFF and Mike Overlay like this. Love my FA tumbler and media separator. Pretty brass. Went to the gun show, Grabbed 1k 9mm 147 gr bullets, 1k small pistol primers, 9mm 4 die set, univ decapping pin, 4 hole turret fixture for my Lee classic and 500 55gr 223 bullets. Came home and finished up priming 1k 9mm cases. (about 250) Took a couple shots of whiskey so no playing with gunpowder tonight. I'll work up a few test loads in the morning since I have the day off. I think I'm going to try using the Tightgroup powder I've had for awhile but never used. Anyone care to share their Titegroup w/147 gr recipe? Installed the case collator and feeder, and finished up another 150 rounds on the Pro 1000. So far we are working well together, lol. Oh man, that hurts to hear, haha. Those were the first pieces through the 650. I was going to get more primers on the shelf and said "whats this die?" Lager, Metalliman27055 and Wolffy like this. Fixed my Lee auto drum that I broke when I dropped it. Loaded up some 250gr 45 colt Christmas Ammo for my brother in law... Next up: 44-40 for my father in law. Very safe mid range loads that might not be the most accurate but they'll all go bang without going BOOM. Christmas ammo gets checked more times than Santa's naughty/nice list. Oh and I just sent out a check for a used Blackmon swage press with 6mm dies.. I couldn't resist at the price. I figured out my Lee Pro auto disk won't drop a charge below 3.6 grn.... Sonofa.... I had to use my RCBS Uniflow to charge off the press. I need to get that worked out..... I loaded my first 8 rounds of 9mm. I loaded 2 different COALs. Now I just need to test fire them. Created this, it's a 350gr FP loaded over 15gr or Trail Boss for a 45-70. Single stage and forgot to change the expander for the seater, but only for one round. Buy the auto drum and never look back.